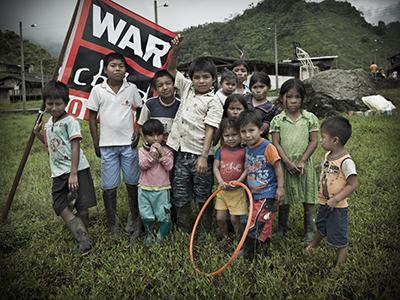 In Colombia, an external evaluator reviewed the activities of four of War Child’s new partners within the Conn@ct.Now! project: COCA, CECIDIC, Pastoral Social and Fundacion Talentos. The evaluation included visits to six communities, the facilitation of five focus group discussions with children and four with adults (including project staff, teachers and representatives of local authorities), in addition to interviews with both children and adults. The evaluation concluded that all partners had a good understanding and analysis of the conflict context in which they were working and the related protection risks for children. However, the evaluation found no clear link between this analysis and the activities implemented as part of the projects. The projects focused on relevant, pertinent, but stand-alone activities, such as life skills training, ICT training, and developing communication products, but lacked a broader response to the child protection risks identified. The evaluator concluded that the organisations should take a broader child protection approach, looking at developing children’s skills to protect themselves, strengthening (community-based) child protection systems and advocating for better protection responses from local authorities. Adapting this approach is especially important as these organisations are often amongst a very limited number of organisations with access to these conflict-affected communities. For example, the evaluation found COCA’s project to be a very relevant response to the psychosocial needs of indigenous communities, but that activities should be complemented by advocacy and cooperation with local authorities responsible for child protection (including psychosocial support) to increase the sustainability of their work. The evaluation results were discussed with each organisation during the design of their new project plans for 2014. Using learning from the evaluation, War Child is supporting its partner organisations to start building a clearer and broader child protection perspective into their projects.